Finally I am on my way with this sock. The stitch pattern is from a sweater in a Japanese “Let’s Knit” pattern book. I should be further along with the knitting but I kept changing the graph/knitting to get the design to meld into the rib border better. Plus I tried several different ways to get the crochet clusters to work. The stitch pattern in the book said to do them into a stitch that was worked as a purl the row before. That purl kept riding up over the cluster. I think a crossed knit stitch works best as the base. Then there was the problem of getting the left slanting decreases straight. Ria‘s suggestion worked wonders. Now the leaf has smooth border stitches. Thanks so much to everyone for all the comments on the previous post. The suggestions really helped me learn how to get different looks for those decreases. Every one of them has a place in a knitting technique repertoire. Thanks again! 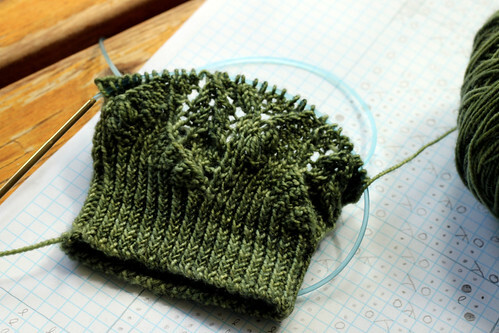 This entry was posted on Wednesday, June 17th, 2009 at 3:00 am and is filed under Knitting. Tagged: Knitting. You can feed this entry. You can leave a response, or trackback from your own site. What an interesting looking sock – and the yarn looks great for it as well. I can’t wait to see it a little further along. So, LOL!!! Whatever happened with this sock?? I wanna know! It’s really cool pattern!